Harvest Moon is back, at least in Japan. A new entry in the Harvest Moon series is coming to the 3DS in Japan next February, developer Marvelous AQL told Famitsu. The new game will be called Bokujo Monogatari: Tsunagari Shintenchi, which roughly translates to "Harvest Moon: Connecting New Lands" according to Polygon. 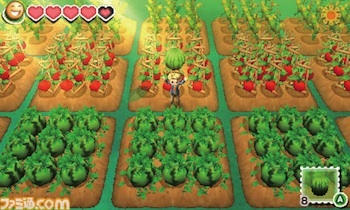 Series producer Yoshifumi Hashimoto says the name alludes to the game's StreetPass functionality, which will allow players to visit each other's farms, as well as the game's emphasis on "making connections to other countries via trade." Hashimoto says the game revolves around establishing an import/export business, trading goods with an increasing number of countries, each of which will have different import needs and unique items to trade. "These are wild animals, though," says Hashimoto, "so instead of taking care of them you're more just helping them out with their lives, but you'll be able to watch over all sorts of animals in the Safari. Instead of taking them home and raising them, you're securing a sanctuary for them and building up the number of animals who live there. " Hashimoto also said the new game will have double the animal types of past entries in the series. As of now, there's no word on a North American release for the new Harvest Moon. The last entry in the series, Harvest Moon: A New Beginning was released in the US about nine months after coming out in Japan.